A luxurious self-catered 4-bedroom Treeline townhome with vaulted ceilings, a stone fireplace, heated floors, and a shared hot tub. This 4-bedroom Treeline resort home has everything you desire for an unforgettable Whistler ski holiday! 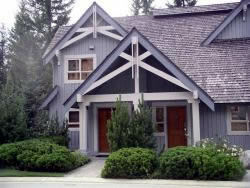 Located in the prestigious Benchlands, the Treeline development is close to all the Whistler tours and activities, but far enough away to preserve the peace and tranquility of a Whistler mountain retreat. A FREE village shuttle will take you to Whistler and Blackcomb gondola bases and to Whistler Village right through to the early hours. After a long day of skiing, if the snow conditions permit, you can ski-out on Blackcomb to a relaxing shared hot tub. 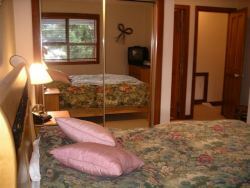 This mountain retreat accommodates up to 9 people in total and features an ensuite jacuzzi tub and double shower stall. Contact us for more information on this Whistler 4-bedroom town house. 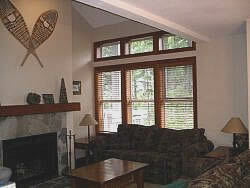 Other Whistler ski accommodations are available in this complex.